(137) When I am healed I am not healed alone. (138) Heaven is the decision I must make. Back in Manchester attempting to grapple with UCAS forms (hopefully sorted it now). Questions of spirituality crop up everywhere, and tonight it was in Jam Street Café with a group of writers, performers, film makers, and artists. I think creative people by and large understand that they are channels for their art, that their most exciting work comes from a time when they are ‘in the zone’, in a place of allowing things to flow. Tonight’s discussion with members of Speakeasy was a real joy, thanks guys, it’s good to connect in that way and Chris, I totally agree that we create our own heaven or hell right here. I didn’t even remember that my lesson today was ‘heaven is a decision I must make’ and I made a little bit of heaven tonight. 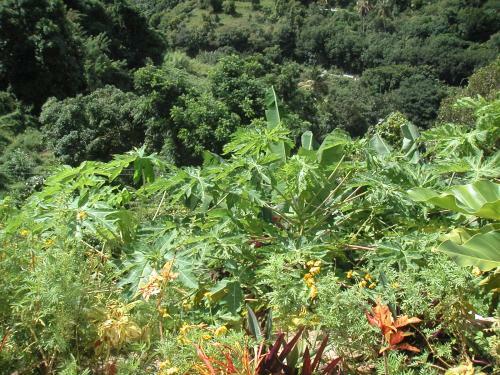 Pic is of a view from my friend’s balcony in Barzey’s, Montserrat. A little bit of heaven. This entry was posted in A Course in Miracles: Lessons (h) 141-150 Reviews. Bookmark the permalink.